Esoteric Orders and their Work and the Training and Work of an Initiate examines how occultists have jealously restricted admission to their secret societies and schools and shrouded their practices in mystery. Dion Fortune, founder of The Society of the Inner Light, is recognised as one of the most luminous and significant figures of 20th Century esoteric thought. A brilliant writer, pioneer psychologist and powerful psychic, she dedicated her life to the revival of the Mystery Tradition of the West and she left behind her a solidly established knowledge of many systems, ancient and modern. This special edition brings together two immensely valuable classic books which make the complex foundations of psychic development accessible to all readers. Esoteric Orders and Their Work examines how occultists have jealously restricted admission to their secret societies and schools and shrouded their practices in mystery. Dion Fortune here uncovers the workings of these secret organisations and describes their operations in detail. The Training and Work of an Initiate shows how, from their ancient roots, the Western Esoteric Systems have an unbroken tradition of European initiation that has been handed down from adept to neophyte. 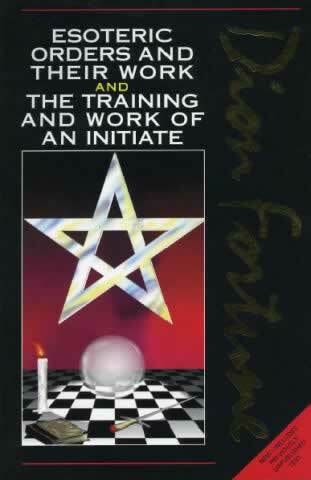 This book indicates the broad outlines and underlying principles of these systems in order to illuminate an obscure and greatly misunderstood aspect of the Path.